Miscreants beware! The Falcon is on the hunt! Suave, sophisticated, hard-boiled and high-minded, amateur sleuths Gay and Tom Lawrence (a.k.a. 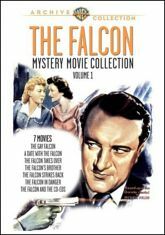 The Falcon) were a perfect fit for the acerbic styling of siblings George Sanders and Tom Conway. Follow the saga from the start with this 3-DVD, 7 film collection spanning the years 1941 - 1943.